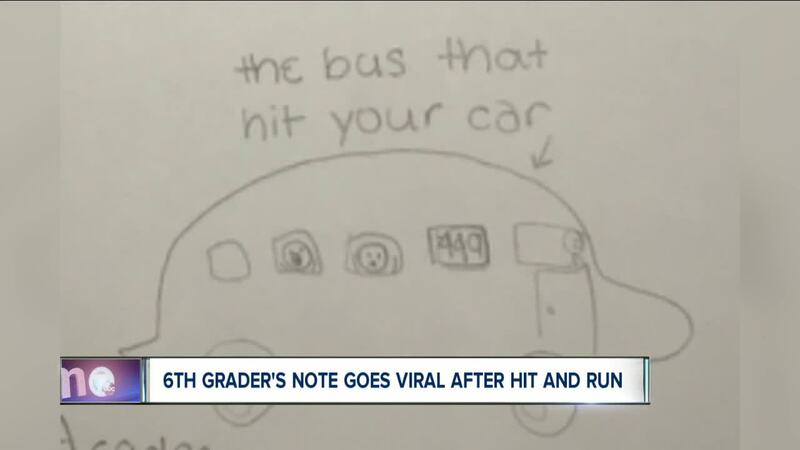 6th graders note goes viral after hit and run. Hannah Buehler reports. A sixth grader is being celebrated for stepping up when an adult did not. She came back to leave a note on a car that was allegedly damaged by her bus driver. The sixth grader explained that her bus had hit the car and drove away. A Canisius College upperclassman, Andrew Sipowicz, shared the note alongside two pictures on his Twitter feed with the caption: "Shoutout to the anonymous 6th grader for saving me a couple thousand (Bus not drawn to scale)." He also shared this: "Update: The student who wrote the letter has been found and we’re in the process of finding a way to reward her for her actions. Very grateful for what she did"
"I think it set a good example for other students, not just students but people in general," he said. "I would like to thank her so much for doing the right thing." 7 Eyewitness News spoke with Houghton Academy--Buffalo PS 69--about the 6th grade student. Vice Principal Kevin Garcia said the school will be "celebrating her outstanding leadership"and presenting her with an citizenship award in the upcoming weeks. The student's teacher also took to Twitter to share his congrats. A Buffalo Schools spokeswoman added, "Kudos to the 6th grader. We always tell our students if they see something to say something. Sipowicz says someone from First Student, the bus company, came to take a report of the incident. First Student issued a statement to 7 Eyewitness News reporter Hannah Buehler.